Timeless’ two-part season finale was one for the history books. But, before we go any further, this review contains major spoilers for episodes 9 and 10. Tread carefully if you haven’t seen it yet, because you’re definitely going to want to experience it all for yourself. The finale was…a lot. In a good way, if not bittersweet. Emotionally exhausting, powerful, and captivating at every turn, Timeless delivered an action-packed two hours that changed the game completely. Beyond that, the show proved without a doubt that it deserves to stick around, highlighting the series’ strengths and allowing the characters to draw viewers into its most shocking, heartbreaking moments. 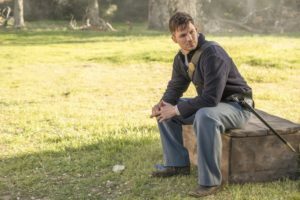 Timeless offered one of the best season finales in recent memory and the fact that we’re all still frantically thinking about its closing minutes is a testament to how damn good this show is. 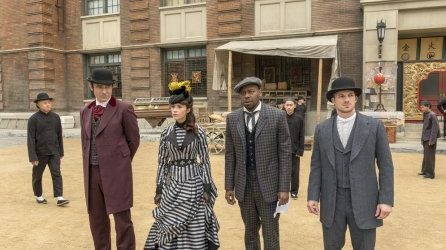 Now that Timeless has hit its stride and worked out most of its missteps, it would be a shame for NBC to cancel it when the show has just found its footing. “The General,” the first half of this doubleheader finale, is the culmination of Timeless’ format this season; a format that has explored the narrative and its characters in unique ways. The Time Team has to locate and take out a sleeper agent hidden away in the past, and this time the fate of the Civil War hangs in the balance. If they don’t succeed, the Rittenhouse sleeper agent—a Confederate general, activated by Emma herself with a modern book on the Civil War to guide him—will turn the tide of the war in the Confederate Army’s favor. They’ve already started slaughtering Union troops, as the Time Team (this episode including Lucy, Wyatt, Rufus, and Flynn) soon stumbles upon the massacre. And it isn’t just any regiment, of course, because Rittenhouse’s insidiousness digs in particularly deep: these soldiers are supposed to help Harriet Tubman in her raid on the Combahee River. It’s a vital historical event that freed slaves and aided the Union Army in its fight against the Confederates. 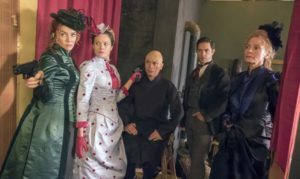 As the show has done over both seasons, Timeless gives screen time to historical figures often forgotten, or in this case, sheds some light on a side of them we’re not told much about. Harriet Tubman was most known for her work with the Underground Railroad, but she was also a spy for the Union Army. 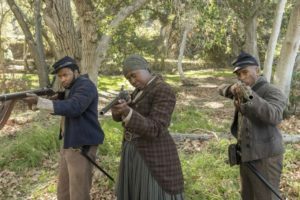 Christine Horn portrays Tubman as a no-nonsense leader with a kind heart, a performance that stands out among this season’s string of talented guest stars. Her story is told beautifully, whether it’s her heartfelt, honest conversations with Rufus or her moments of badassery where she shoots the sleeper agent herself. “Wanna tell me my place again?” Tubman challenges, followed by the most epic shot of the season: her forces gathered behind her, ready to fight. Not all is well within the Time Team, though. Before sending them on their way, Agent Christopher and Connor Mason reveal the images of Jessica from Rittenhouse’s hard drives: hundreds of pictures dating back to her childhood. Wyatt reacts badly, defending his wife and dropping the news of her pregnancy on his fellow bunker mates. He spends much of the episode lashing out and distancing himself from Rufus and Lucy, who are only trying to steer him in the right direction. Neither of them trust Jessica, but Wyatt is unwilling to see past the idealized image he’s had of his wife now that she’s back. And he’s got a dose of jealous rage to go along with his bad attitude; Lucy and Flynn’s budding relationship causes him to make passive aggressive remarks the whole time. He deserves that jealousy for now, for all he’s done to Lucy. But still, they keep gravitating toward each other, always drawn to one another even if they’re not getting along. But…Wyatt really should have listened to his friends. His family. That’s what “Chinatown” is all about: the bonds of family, whether they’re blood or found, and all the ways in which they can be strained and tested to the limit. That’s what this season of Timeless has been building; showing us more of these characters and their dynamics, making them real people with flaws who lean on each other despite their mistakes. It just so happens that this is a very big mistake. Jessica is, in fact, a loyal member of Rittenhouse, a sleeper agent sent by Carol Preston to gain intelligence on the Time Team. (In Flynn’s words, “Boom goes the dynamite”). She’s not the Jessica that Wyatt knew in his previous timeline. Far from it. She steals his gun, kidnaps Jiya, and heads back to Rittenhouse HQ with the Lifeboat. This wins praise from Carol and Nicholas, but it doesn’t exactly thrill Emma, who’s now totally replaceable. And pissed off. Jiya can handle herself, though, and launches a kickass escape from Rittenhouse prison. She’s understandably traumatized from having to kill a random goon, but she manages to flee and recapture the Lifeboat. In the ensuing chaos, she’s unable to land in the bunker and the team fears she’s adrift somewhere in time. Desperate to locate her, they begin to search all of history for her in pictures and text, but it’s Lucy who remembers Jiya’s obsession with a book on San Francisco’s history. Inside, they find a grainy, black-and-white photograph of Jiya in 1888 Chinatown. Hidden in her photograph is a set of coordinates and a message…written in Klingon. (This show truly is a nerd’s dream). Despite Jiya’s warning not to come after her, they track down the Lifeboat, now aged 130 years and covered in rust and vines. After Rufus and Connor get the machine back in working order, the team is off to 1888. Unfortunately for them, Rittenhouse has arrived first, tracking Jiya with the Mothership. Emma trains her gun on Lucy to take her out, but Carol steps in front of her and takes several bullets to the chest. Emma turns the gun on Nicholas, killing him instantly. This leaves Emma and Jessica to seize control, shoving all that “pure bloodline” stuff to the curb. As far as we know, Lucy is the last of the “Rittenhouse royalty,” and it’s Carol’s dying wish that her daughter ascend to the throne. Her only regret? That she didn’t indoctrinate Lucy from a younger age. After everything Lucy’s been through this season because of her mother, it’s the last thing she wants to hear even as she tries to save Carol’s life. There was a glimmer of Carol’s possible redemption before, but it’s clear now that her loyalty was always with Rittenhouse, a cause she loved more than her daughter. Attempting to outrun Emma and Jessica, the team reunites with Jiya in a Chinatown saloon. She’s changed a lot since she’s last seen her friends. (Her reunion with Rufus is adorable; he scoops her up into his arms as the music swells and it’s a perfect romantic moment). She’s been in the past for three long years, creating a life for herself and practicing how to access her visions. …Yeah, about those. Jiya’s learned from a previous pilot who also had these premonitions that she’s actually traveling through time in them without a machine. Although it sounds like a cool ability to have, this dude has spent weeks mentally time traveling instead of living in the present. Jiya faces that same danger if she can’t resist the temptation. For three years while hiding out, Jiya’s been tormented by her vision of Rufus’ death. With no other way to stop it, she’s resigned herself to remaining in the past—if she leaves, Rufus will die in the shootout that follows. Jiya has hardened in those three years, breaking wrists and deciding to put Rufus’ well-being above her own comfort. But it’s not what Rufus wants for her no matter how good her intentions are. No amount of pleading sways her to change her mind, until Lucy, irritated and at the end of her rope and desperate to save her friends, gives everyone the motivation they need. “None of us have anything anymore except each other,” Lucy says. “That’s how we’ve survived this long. No matter how bad it gets, we’re together. We’re taking out Rittenhouse together. We’re going home together.” And that, right there, is everything Timeless has built these past ten episodes. Lucy hasn’t lost everything; she still has this family that she’s found through some pretty extraordinary circumstances. (Though Rufus is quick to label Flynn the “creepy uncle”). It’s Timeless’ strongest theme, the glue that holds the entire show together, the part that draws fans to it. These characters and their relationships with each other. We care about them and their struggles immensely. We love them as if we’re a part of their team, because they’ve pulled us into this wild adventure alongside them. And, of course, it hurts us to see them hurting and broken. 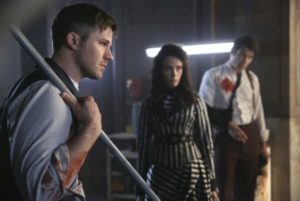 There are fractures when the episode begins—Rufus mad at Wyatt for endangering Jiya; Lucy upset when Wyatt accidentally hits her while fighting Flynn. When Jiya’s vision comes to pass and she averts the crisis by shooting the goon that would’ve stabbed Rufus, it feels like a victory. Rufus and Jiya are elated, kissing and holding each other close. For a moment, we think Timeless’ season-long debate over whether you can change certain horrible, fated things has ended well. But then the Time Team is caught up in another shootout while leaving the saloon and Rufus is gravely wounded by Emma. His friends, gathered around him, watch as he succumbs to his wound, each one of them powerless to stop his fate. We’re left shocked and numb—how could Rufus, the heart of Timeless, leave us? The rest of the episode passes in a blur of raw emotion. Lucy chases down Emma, distraught at how this woman has taken every good thing from her life. She fires until her gun is emptied of bullets, and would’ve put one between Emma’s eyes (though there’s still a hesitation there, because this is Lucy Preston…though she has clearly reached her limit) if she had enough left. They grapple and Flynn scares Emma off. Utterly spent, Lucy can’t do anything but sob as Flynn holds her close. It’s such a soft, intense moment, sparking a million possibilities for these two. But for now, as he’s done since Jessica came back, Flynn is there to comfort her. The team returns to the bunker bloodied and beaten up, exhausted physically and emotionally. Mason’s reaction to Rufus’ death is gut-wrenching, and all the team can do is stand around trying to process it. They’re broken, lost in their grief. Jiya tries to escape into her visions in a last ditch effort to find Rufus, and it’s Mason who pulls her out of it. He doesn’t want to lose her, too. Everyone’s performances in this episode have been incredible, but you can literally feel Lucy, Jiya, and Mason’s anguish in your soul thanks to Abigail Spencer, Claudia Doumit, and Paterson Joseph’s performances. Wyatt struggles with Jessica’s betrayal and manipulation, her loyalty to Rittenhouse, and the fact that she might be carrying his child. (Still not a fan of this particular detail, if it’s true). He admits to Lucy that he screwed things up between them, but he loves her. Wyatt tells her the truth, finally, because Rufus wanted him to. Lucy’s silence on the matter speaks volumes; she’s not ready to say it back. He needs to earn her trust again, needs to work to repair what’s become broken between them. But they’ll find their way back to each other eventually. In true Timeless fashion, there’s a last minute twist: a secondary Lifeboat shows up in the bunker and future versions of Lucy and Wyatt climb out looking very post-apocalyptic. “You guys wanna get Rufus back or what?” Future Lucy asks, as the Time Team looks on in confusion. It’s become an established rule that you’re not allowed to travel back into your own timeline. So, it looks like Flynn’s little story about Lucy may have hinted at some interesting upgrades to the Lifeboat after all. Now we have the perfect set up for season three: saving Rufus and taking out what’s left of Rittenhouse before they make a mess of the future. Leaving us with that cliffhanger would be above and beyond cruel, considering the fan outcry last season. 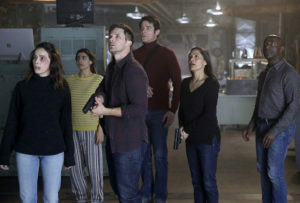 If anything, Timeless’ finale proved why it’s one of the best shows currently on network TV and if NBC is smart, they’ll let it continue.